Links to all OCHA Situation Reports are listed here. To see who is doing what, where see the Relief Organization Presence Map. Page 1 shows the map. Pages 2, 3, and 4 list the full names of the organizations. 2-[Help] displaced persons to find refuge in a ‘host’ home, especially among members of their families or friends. 3-If none of the above is possible, the Government and partners prepare and clean up the larger facilities where people have gathered since the earthquake. 4-In cases where no such solution is possible, the IOM will help the government to establish new sites. Also read Catholic Relief Services: Haiti rebuild presents herculean task and Red Cross: Haiti Housing the Homeless. 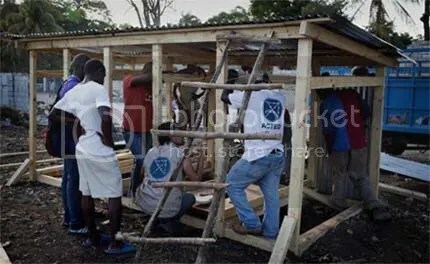 The IFRC plans to eventually build 20,000 core houses – using materials (mainly wood) shipped into Haiti by the logistics unit at base camp in Port-au-Prince. The newly standardized package of construction materials – timber, panels for metal roofs, plastic sheeting for walls or floors, nails and fixings – will enable Haitians to build a relatively robust core shelter of 12 square metres. These can be moved and extended when space and resources allow. Humanitarian tarpaulins distributed over the past two months can be retained as an additional covered area. The core houses will be targeted at beneficiaries in both urban and rural areas, while a subsequent drive to build larger (24 square-metre) “transitional” houses will focus on rural and lower density urban areas. A Logistics Cluster representative was in Leogane today along with a member of UNHAS to establish a plan for helicopter deliveries to outlying areas which so far have received little assistance. To qualify for a duty and tax exemption on the importation of goods into Haiti, NGOs must be registered in-country… Organizations not currently registered in the country may be able to seek the assistance of the Direction de la Protection Civile (DPC) in clearing their goods. The LC in PAP has published an updated customs brief and is offering assistance to organizations facing customs-related difficulties. The Logistics Cluster is has been requested to assist with incoming bilateral donations by the government of El Salvador. Similar facilitation has already been provided for the governments of Mexico and Taiwan. February 19, 2010 The debris resulting from the earthquake on Jan. 12 in public areas in Haiti have been collected almost entirely thanks to an initiative of the UN Program for Development (UNDP) to offer money to people who be involved in cleaning. Aid officials are rushing out tarpaulins in a bid to provide some kind of shelter to all those made homeless, but only about 30 percent have received materials so far, according to the United Nations. (Cluster authorities are moving directly into transitional housing. And in general are now asking for corrugated metal roofing — recycled aluminum is best– and timber. Cedar is the most weather resistant and also resists bugs. Timbers are best seated in a metal boot pressure-treated bottom plates on a reinforced concrete slab foundation and best reinforced with seismic bracing. The provision of shelter material continues to be a priority in all affected areas. The number of incoming flights to Port-au-Prince airport continues to drop and now averages 74 per day as incoming air cargo increasingly shifts to sea transport. At the peak of the response, the airport was receiving 160 flights per day. The Port-au-Prince port is handling an average of 350 containers per day now that specialized cranes are in place. The installation of two floating docks at the port will commence on 10 February and be finished by the weekend, increasing capacity at the port to a possible 1,500 containers per day. At Toussaint L’Ouverture Airport in PaP, the majority of all slot requests are granted within + / – 12 hours of the requested slot. The slots are currently allocated by the Haiti Flight Operations Coordination Centre. No slot requests are allocated unless a clear consignor, consignee and consignment details are presented. The Mi8 helicopter managed by UNHAS began cargo flights today out of Port au Prince to carry 1.5 mt of medical supplies to Les Cayes to WHO. Handicap International/Atlas Logistique have a fleet of 13 M6 trucks in Jacmel for interagency transport. The current plan is to replace these with 10 mt trucks for transport within the city in order to redeploy the all-terrain vehicles for deliveries along the more difficult routes outside town. US Joint Task Force engineers completed an assessment of route 2 from Carrefour west to Grand Goave. The road will require immediate repairs to allow for sustained heavy truck traffic. Piling will be installed at the PAP seaport on February 8 – 9 and ready for cargo operations as of February 10 with one 120m x 30m dock and a 200 mt crane.